I know I put some lambs at the beginning of March for the lion/lamb theme, but I just found a cute lamb. I thought some people might like to make it for spring or a farm theme. 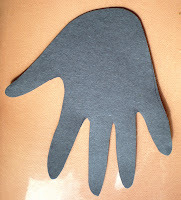 Trace the child' s hand on the black construction paper, cut this out. 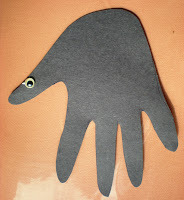 Cover the whole palm area and the top of the finger areas with glue. Place cotton on all the glue. 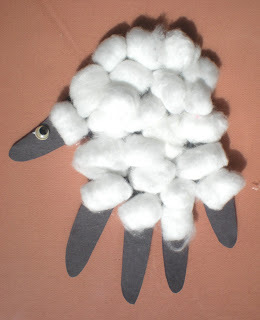 Then add a wiggle eye to the thumb which is the lamb's head. The other four fingers are the lamb's legs.